Purple, red, orange and yellow pigments steal the show. 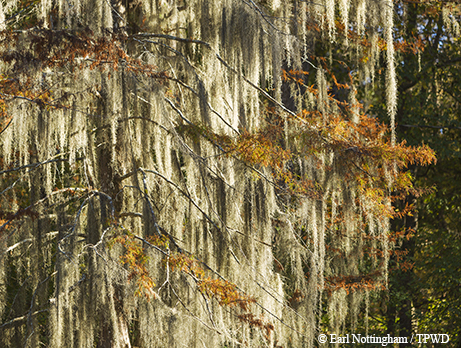 From late October through November, the deciduous cycle of death and renewal erupts with a bang of cellular color. Cold fronts from the northwest pass across the state, creating a rolling gradient of color. Signaled by the first cold snap of fall, the sun-powered, sugar-making chlorophyll of green leaves breaks down and unmasks the purple, red, orange and yellow pigments that steal the show. 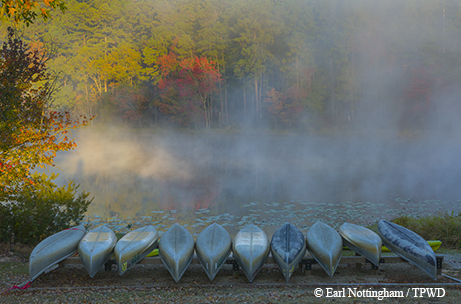 The best color often peaks shortly after the first frost. In anticipation of Thanksgiving, get out and enjoy some of the best weather of the year and one of the best times to visit a Texas state park. Meander through the Lakeview Loop to obtain that dreamy lake mirror-reflection photo or catch a fish at the tree-lined lake. There’s even a pier with hazy morning mist for sunrise photos. This East Texas park’s sumacs, dogwoods and sassafras blush pink, scarlet and maroon, while hickories, red maples and sweetgums transform into towers of yellow, amber and gold beside the famed East Texas evergreen pines. 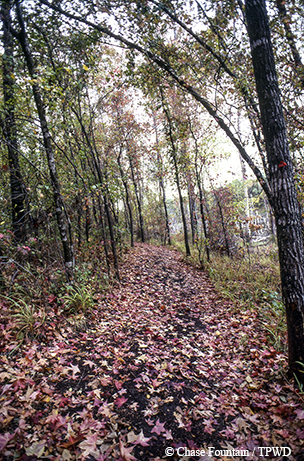 Bundle up in your coziest sweater and boots and travel to Northeast Texas to take a relaxing 2.5-mile stroll on the Rustling Leaves Nature Trail. As you travel through the “Cathedral of the Trees” along the 80-acre lake, lay out your picnic blanket, dare to take a cool dip or make leaf angels along the lakeshore, where wildlife regularly stops for a drink. For a panoramic overlook of the park, hike the challenging, yet rewarding, Mountain View Trail. Grab a leaf identification guide and teach the youngsters (and yourself, too) about our state’s trees. Get started with a tree with one of the most deeply lobed (where’s that glossary?) leaves of any tree in the state — the Uvalde bigtooth maple — and the state park most known for its fall color. The park’s namesake maple trees have survived in this “lost,” isolated pocket since the last ice age to give us a deep vermillion red when the temperatures begin to drop. 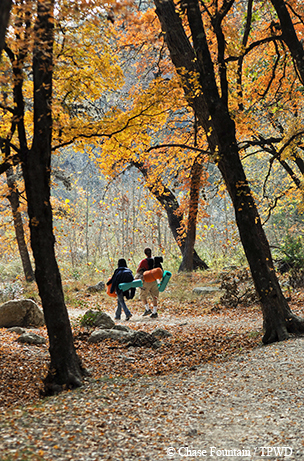 View online fall foliage reports for Lost Maples at tpwd.texas.gov/lostmaples.